"Delicious curry dish that is sure to satisfy. If you like your curries spicy, feel free to add crushed red pepper or ground cayenne to taste." Put millet in a bowl and pour enough water over millet to cover by at least 2 inches. Soak millet 8 hours to overnight; drain. Heat olive oil in a skillet over medium heat; cook and stir onion and garlic in the hot oil until onion is lightly browned, 10 to 15 minutes. Mix millet, 2 1/2 cups water, salt, and cumin into onion mixture. Cover and simmer until millet is tender and water is absorbed, 20 minutes. Stir curry powder into millet mixture until fully incorporated. 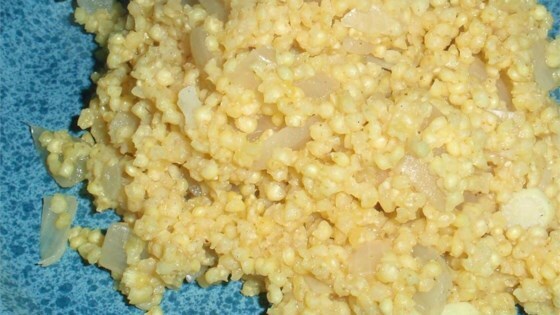 This was a very good and interesting recipe for millet. I didn`t soak the millet, maybe this step depends on millet, but mine didn`t need it. Tasty, this recipe makes a great breakfast. My husband doesn't like curry but it is even good without curry.